The cast includes Diane Milo, Will Perez, Tim Reynolds, Kereli Sengstack, Molly Thornton, and Hayley Lovgren who appears for Ms. Milo on August 2, 15, 24, and 25. Lovgren is also the dance captain and stage manager for the production. The instrumental trio includes music director Michael Johnson leading from the keyboard along with Bob Sunshine on piano and Joe Reichert on percussion. While the full orchestration calls for a seven piece ensemble, this trio covers all the bases adding the excitement that only comes from live music. The reduction is understandable in Tabard’s intimate performance space, but the timbres of some of the synthesized instruments don’t have quite the impact of the real thing. The differences are particularly noticeable on various attacks and sustained clarinet sections in the reed part. The cast delivers a stunning performance. 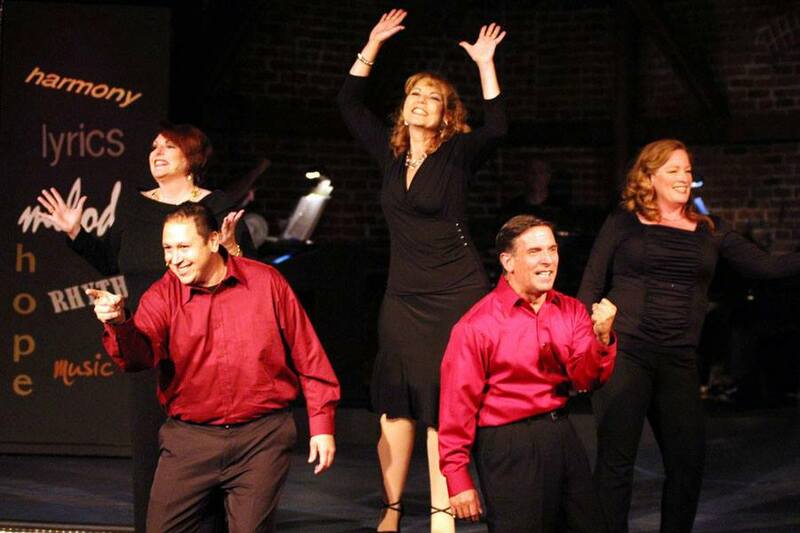 Although this is a revue, the songs are sequenced to tell a story of life. Sometimes songs following a particular topic from different shows are connected such as when Perez and Sengstack cover courtship and marriage through “Marry Me” and “A Quiet Thing” from The Rink and Flora, The Red Menace respectively. The transition is so smoothly written and executed, it reads as a continuous song. Immediately following this segment, Thornton and Sengstack build on it in a very amusing one-upmanship duet comparing marriage to career in “The Grass is Always Greener” from Woman of the Year. There is a nice variety of music including several solo moments and numerous ensemble numbers throughout the show. One of the standout sequences is the progression of Reynolds singing “We Can Make It” from The Rink, Milo singing “Maybe This Time” from Cabaret, and Sengstack singing “Isn’t This Better?” from Funny Lady. These three numbers flow, one into the next, and after each solos in turn, they begin a three part counterpoint that weaves all three songs together. As the vocal trio builds in intensity, the songs blend, and the eventual musical resolution is impressive both in its delivery and its impact. Although the entire show is staged, Act 1 reads a bit more like a concert, the performers not changing costume but utilizing various props as appropriate. In addition to removable props such as Starbuck’s coffee cups and bar stools (and several others that will not be disclosed here), three periaktoi sit stage right. Each one sports three themed sides displaying show titles, a textured sparkly gold background, and a colorful abstract design and are manipulated by the actors at various times. One poignant use of the periaktoi is flipping to the gold backgrounds amidst red lighting to “inflame” the stage during Reynolds’ “Kiss of the Spider Woman” solo. In addition to rather creative staging and props in Act 2, the actors add some costume changes. One nice example is in “Pain”, one of the original numbers in the show. Four of the cast members arrive in dancer’s attire to attend a rather painful dance class played for its comedic effect as their humorously sadistic task master eventually gets his just reward. From heartfelt torch songs, to lively ensemble pieces combined with a large dose of comedy, the show provides a very entertaining evening. Most of Afton Bolz’s choreography fits quite well and enhances the vocals. Only once or twice does it overplay its cuteness, but even then it’s still enjoyable. The only real shortcomings are some of the technical aspects primarily dealing with the sound levels (e.g., Reynolds’ extra hot mic in “Kiss of the Spiderwoman”), and some of the lighting design where sharply focused spots are needed and fall a bit short (e.g., Perez’s “spot” play during his mime work in “Mr. Cellophane”). Even with a few technical faux pas, the show is very uplifting and leaves the audiences wanting for more as they hum their way down the stairs. Don’t miss this one. look at Yahoo’s front page and see how they create news headlines to get viewers interested. You might add a related video or a picture or two to get readers interested about what you’ve written. Thank you for your suggestion; it certainly is worth considering. For the reviews, the titles to date have been related to the content of the article to make them a bit more enticing than “Review: “, but I agree they aren’t always as provocative as many front page headlines. For the commentaries, those titles too are intended to provide a bit of insight into the article they introduce. The promo piece titles are more generic because those articles aren’t providing any analysis. They are intended to publicize a given production or item, and the titles need to identify their target. A fancy or seductive title might be more interesting, but if a reader is merely skimming the surface, a livelier, less obvious title might cause them to miss the point.